Just one hour from London lies the heart of Constable Country straddling the willows and water meadows of the Stour River that winds through the idyllic Suffolk landscape. This classic lowland landscape, straddling the Stour River, has been the inspiration for England’s world-renowned landscape artists Constable and Gainsborough who lived and painted in the Vale. Little has changed over the centuries and with its charming villages, local attractions and beautiful surrounding countryside, the Dedham Vale remains a calm and timeless retreat only an hour from London. The River Stour winding its way through the water meadows and pastures of the Stour Valley; a beautiful and ancient landscape that John Constable, and the other famous East Anglian artists loved so well. It is still much the same as they knew it. One of the fun things to do in the Vale is to take a rowing boat from the Boat House at Dedham and make a slow passage through this beautiful landscape to Flatford and see Willy Lott’s cottage made so famous in Constable’s painting of The Hay Wain. 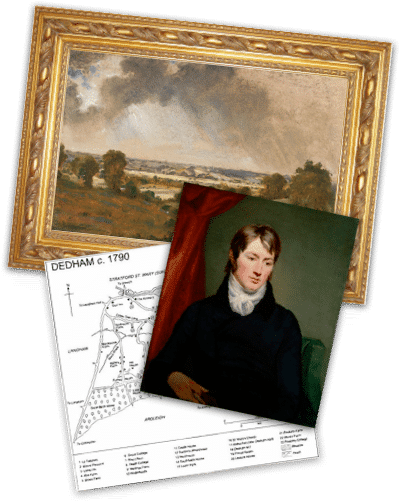 John Constable born in East Bergholt (Higham’s next-door village) in 1776 was an English landscape painter in what became known as the naturalistic tradition. Being born in Suffolk, he is mainly known for his landscape paintings of the Dedham Vale which surrounding his home, and therefore also became known as “Constable Country”. His most famous paintings include ‘Dedham Vale’ 1802, ‘Wivenhoe Park’ 1816 and ‘The Hay Wain’ 1821 and his paintings are now among the most valuable and popular in British Art. He had an intense affection for the area having said “I should paint my own places best, painting is but another word for feeling”. He died in 1837 leaving a permeant imprint on his beloved Dedham Vale. Being designated an Area of Outstanding Natural Beauty (AONB) by the Countryside Commission in 1969 was a key milestone in recognising the tranquillity and natural beauty of the Vale, though even this official status does not protect it from the relentless onslaught of modernisation and development prevalent in other part of the country. Thankfully the Dedham Vale Society was founded in 1938 and has be successfully fighting for the protection of our landscape, built heritage and wildlife for over 80 years. While the vast majority of East Anglia’s historic grasslands have been drained and ploughed over the centuries to make way for arable farming, thankfully the Vale has avoided this peril and retained its rolling farmland, ancient woodland, meadows, river and villages to become one of England’s most cherished pastoral landscapes. With a relatively sparse population of fewer than 10,000, the Valley is proud to retain its farming characteristics while holding back the insatiable appetite for development. Constable would still recognise his cherished landscape today with most of his views still largely intact – Idyllic Suffolk’s properties in Higham being a fine example as painted in ‘Higham Village in 1804.